With two weeks to go before shipping a lot is going to happen. The basic plan in place for this week is to get all the machines finalized and running, then on Saturday everything is to be re-skidded onto their pallets. In our booth we leave the machines on their pallets and make them look nice. It is less expensive to do it that way and to be blunt no one really ever notices or says anything. I am fortunate that I am Involved in the Association for Manufacturing Technology. This trade association is not only instrumental in the production of IMTS, but they have an arm that looks out for Manufacturing’s best interests in Washington. Some of the Tax cuts that aided machine tool builders in the past 10 years were lobbied for by this association. 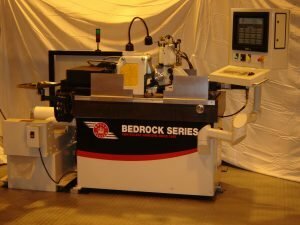 From concept to reality, we have been talking about the Bedrock series for a while now. This new machine platform besides being really cool looking offers a ton of advantages for production grinding. You can see that the machine is done and is getting tooled out for the show this week also. In about a week you can visit our web site booth6646.com for videos of all our machines in our booth.